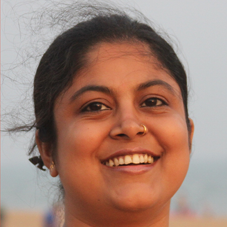 In her present work Somdatta is trying to showcase how the concept and practice of haṭha yoga has burgeoned as a French believing and emerged as a mind-body-technique. This showcasing has been manifested by an ethnographic experience that she had been engaged in for nine months in Paris. The ethnographic field work on Eva Ruchpaul and Dorothea Hirsch has entirely been used to fathom the tradition and transmission of haṭha yoga (as the practitioners claim it to be) in French milieu. This ethnographic study has also been maneuvered to exhibit how French believing has been thriving at the confluence of the vulgarization of haṭha yoga and advaita. To trace back the root of this French believing she has completed ethnographic field work at Ramana Maharshi Ashram, South India. How the elective fraternity of Ramana Maharshi, the haṭha yoga class-rituals at both Eva’s and Dorothea’s institute help gravitate the practice to religiosity is also a crucial focal point of her present work. She has been working under the guidance of Professor Erwan Dianteill. 2017. «The impact of perceived social support on depression among elderly population in Kolkata »- Andhra Pradesh Journal of Psychological Medicine 2017; 18(1): 25-30, ISSN 2249-5851.